This article originally appeared in the Winter 2006 issue of Queen’s Quarterly, a journal published by Queen’s University in Kingston, Canada. One hundred fifty million dollars sounds like a lot of money. 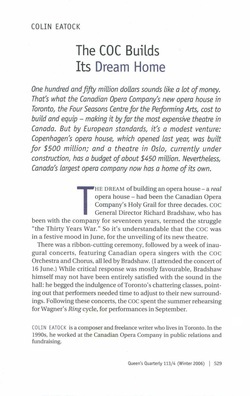 That’s what the Canadian Opera Company’s new opera house in Toronto, the Four Seasons Centre for the Performing Arts, cost to build and equip – making it by far the most expensive theatre in Canada. But by European standards, it’s a modest venture: Copenhagen’s opera house, which opened last year, was built for $500 million; and a theatre in Oslo, currently under construction, has a budget of about $450 million. Nevertheless, Canada’s largest opera company now has a home of its own. The dream of building an opera house – a real opera house – had been the company’s Holy Grail for three decades. COC General Director Richard Bradshaw, who has been with the company for seventeen years, termed the struggle “the Thirty Years War.” So it's understandable that the COC was in a festive mood in June, for the unveiling of its new theatre. There was a ribbon-cutting ceremony, followed by a week of inaugural concerts, featuring Canadian opera singers with the COC Orchestra and Chorus, all led by Bradshaw. (I attended the concert of June 16.) While critical response was mostly favourable, Bradshaw himself may not have been entirely satisfied with the sound in the hall: he begged the indulgence of Toronto’s chattering classes, pointing out that performers needed time to adjust to their new surroundings. Following these concerts, the COC spent the summer rehearsing Wagner’s Ring cycle, for performances in September. Since the founding of the Canadian Opera Company, in 1950, the company has performed in a number of Toronto venues, including the Royal Alexandra Theatre, the Elgin Theatre, and, most frequently, a facility originally called the O’Keefe Centre and re-named the Hummingbird Centre ten years ago. None of these theatres were built for, or suited to, opera: the Royal Alex and the Elgin are too small for large-scale productions. And the Hummingbird is too big: its vast, fan-shaped auditorium, with seating for 3,200, resulted in dreadful acoustics. And all three theatres lacked proper orchestra pits, or adequate backstage space, required for scenery changes. The COC’s founding general director, Herman Geiger-Torel, first proposed the idea of a new theatre back in the 1970s. But it was Lotfi Mansouri, General Director from 1976 to 1988, who pressed the project forward. His plan was for a grand culture palace, to be built at the corner of Bay and Wellesley streets – called the Ballet Opera House, as it would be co-owned by the COC and the National Ballet of Canada. Appointed to design the building was Canadian architect Moshe Safdie, best known in this country for Ottawa’s National Gallery. However, when cost estimates for the Ballet Opera House rose from $230 million to $311 million in 1990, it became an easy target for the Bread Not Circuses Coalition – a left-leaning Toronto group opposed to government-funded megaprojects. Bob Rae, Ontario’s newly elected NDP premier, reversed a promise made by the previous Liberal government to donate land and $65 million in cash. Other levels of government took this as their cue to also withdraw. For a while, Toronto’s opera house looked dead in the water. Rumours floated to the surface from time to time about possible new sites: on the lakeshore, at Moss Park, or in the city’s emerging St. Lawrence neighbourhood. And there was talk of refurbishing the Hummingbird, although this idea was vigorously opposed by the COC. By 1997, the company had regrouped, and announced a new plan: a modest theatre at the corner of University Avenue and Queen Street West. It could be built, the COC proposed, for a mere $60 million – and without government subsidy. Certainly Ontario’s right-of-centre Progressive Conservative government wasn’t about to contribute any money: in an empty gesture of “support,” the Province, which owned the city block in question, agreed to sell the site to the COC, at full market value. The scheme was, to say the least, unrealistic. There was no way to build an opera house worth building for just $60 million – and construction estimates gradually climbed to $150 million (or $181, with the land, valued at $31 million, factored in). Nor was it apparent how the COC, which at the time had an annual budget of just $15 million, could possibly raise that kind of cash privately. But no one can say the company didn’t try. For a time, Bradshaw claimed to have a mysterious $20-million private benefactor lined up, who failed to materialize. As well, there was a proposal to have real-estate developers Olympia & York pay the COC to build an office tower on top of the theatre. (Fortunately, nothing came of this idea.) Yet if the COC’s efforts sometimes seemed unlikely, or even desperate, they were merely a reflection of the ideological roller-coaster ride that was Ontario politics in the 1990s. Another challenge that the Canadian Opera Company faced, when it returned to the drawing-board in 1997, was finding a new architect. Some of Toronto’s movers and shakers urged the COC to hire Frank Gehry, renowned for his Guggenheim Museum in Bilbao, among other projects. However, in addition to his reputation for cutting-edge design, Gehry also had a reputation for cost overruns, and the COC shied away. Instead, the company chose Jack Diamond, a local architect known for functional, if not always remarkable, buildings – and also known for staying on budget. His design called for a 2,000-seat, horseshoe-shaped auditorium, a sophisticated orchestra pit with adjustable dimensions, and adequate backstage space for scenery. Another selling point was the front lobby – Diamond dubbed it the “City Room”– with a glass façade that would glow like a beacon when illuminated at night. The COC broke ground in April 2003, and three years later Jack Diamond’s opera house was completed. In hindsight, the decades of delay and setbacks may have been a virtue, as they forced the COC to consider, over and over again, exactly what it wanted, needed, and could reasonably expect from a new theatre. From the giant rubber pads on which the building sits (to eliminate vibrations from the subway line that passes underneath) to the 1:2 ratio of male-female washroom facilities, Diamond and the COC seem to have considered everything – although, due to budgetary considerations, not everything wished for was possible. As well, there were space constraints: the 1.7-acre city block on which it stands is just barely large enough to accommodate an opera house, so efficient use of space was also a priority. So what, exactly, did the citizens of Toronto, Ontario and Canada finally get for their money? What we got is a well designed but basic facility that should, judging by the success of the Ring cycle, serve its purpose well. The sleekly modern City Room suggests a sense of occasion, without excessive formality. Perhaps the most striking feature of the auditorium is the closeness of the audience to the performance: the horseshoe design, with a parterre and four balconies, brings 73 percent of the seats within 100 feet of the stage. Sightlines are excellent, and even from the worst seat in the house the entire stage can be seen. Acoustically, the hall is impressive for its clarity and intimacy – properties that benefit performers as well as the audience. After the opening concerts, I spoke to several COC musicians, all of whom pronounced the orchestra pit a great improvement over conditions at the Hummingbird. What we didn’t get, however, is an iconic, monumental, or even particularly impressive building. This is no Sydney Opera House – it’s a brick-and-glass box that blends in with the surrounding offices, law courts and hospitals on University Avenue. Even the auditorium – gray and beige, and generally lacking in distinguishing features – seems to say, “Don’t look at me; I’m just a receptacle for the art I contain.” Michael Crabb of the CanWest News Service aptly called the theatre an “emphatic testament to a very Canadian propensity for unostentatious practicality.” One can only wonder what Gehry might have come up with, if the COC had been in a position to engage him. If the Four Seasons Centre isn’t about to raise Toronto’s stature in the realm of architecture, will it at least put the city on the operatic map? It can only help. Currently, the COC, which stages only six or seven different operas in a typical year, occupies an unimposing place in the pecking-order of the world’s opera companies. On a recent trip to Europe, I met with music critics in London who had no idea that a new opera house was under construction in Toronto. Berlin’s opera bureaucrats were blissfully ignorant of the COC’s Ring cycle. When I spoke to Riccardo Muti – for two decades the artistic director of La Scala in Milan – he had never heard of the new theatre, or of the Toronto Ring, or even of Bradshaw. In North America, Toronto’s opera company is hardly in the same league as New York’s Metropolitan Opera, with its annual budget of US$220 million. And in recent years the COC has been financially eclipsed by companies in Los Angeles and Washington DC. Of course, artistic achievement can’t be measured in dollars and cents. And international recognition does not always go where it should. On many occasions the COC has shown that it can punch well above its weight, artistically speaking – and this seems to be particularly true of the COC’s productions of twentieth-century opera. The double-bill of Bartók’s Bluebeard’s Castle and Schoenberg’s Erwartung, first staged in 1993 and revived in 1995, is a theatrical tour-de-force. In the last decade, COC productions of Stravinsky’s Oedipus Rex, Debussy’s Pelléas et Mélisande, and works by Janácek have proven that the company can do impressive things, even in the opera-hostile Hummingbird Centre. The decision to stage a Ring cycle – announced before the COC had built a theatre in which Wagner’s tetralogy could be properly mounted – was a bold stroke of brinkmanship that may pay dividends. More than anything else in the operatic repertoire, the Ring has a way of attracting fans from far and wide. According to Elbourne, 20 percent of the COC’s Ring tickets have been sold outside the country – mostly to Americans, but also to enthusiasts from as far away as Argentina, South Africa, Australia and Japan. Foreign critics will also attend: through them, news of a plucky opera company in distant Canada may finally reach the outside world. Closer to home, the Four Seasons Centre will surely raise the bar of expectations amongst the COC’s constituency in and around Toronto. Opera patrons are hard to please, and everyone will want more of something: more international stars, or Canadian singers; more challenging, high-concept productions, or lavish, Met-style stagings; more popular “comfort operas,” or unusual, lesser-known works. And what of Canadian opera? There isn’t a note of it in the COC’s inaugural season in its new theatre. It won’t be long before Canada’s composers start banging on the stage door, demanding to be admitted. 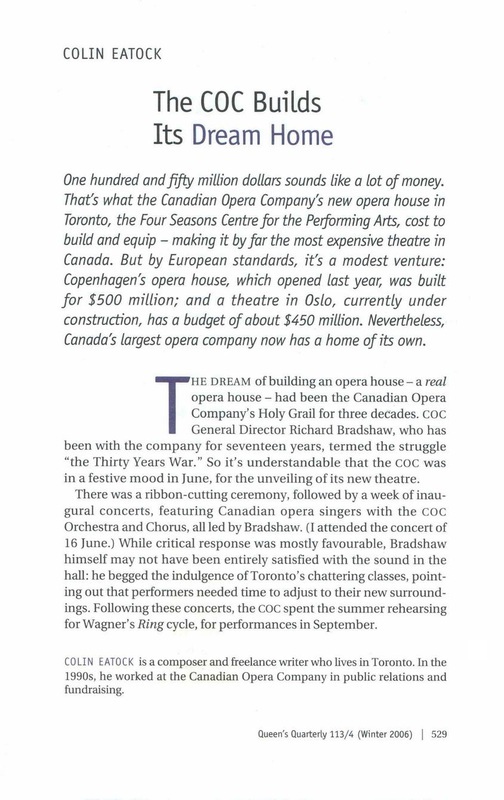 But before any of these aspirations can be addressed, the Canadian Opera Company must first come to terms with operating a $150-million theatre. For many years the COC was a tenant at the Hummingbird Centre, which is owned by the city of Toronto. While this arrangement was problematic in many ways, it also meant that the COC wasn’t responsible for the maintenance of the building. At the ribbon-cutting ceremony in June, Bradshaw said that he didn’t really know how his company would run the Four Seasons Centre – adding that, for now, the building’s completion was cause enough for celebration. However, Elbourne claims that the COC has put together a “careful business plan.” A crucial component of this plan is the National Ballet of Canada, which has agreed to rent the theatre for all its Toronto performances. Only time will tell what effects the Canadian Opera Company and the Four Seasons Centre will have on each other – what benefits will accrue, and what problems will arise. Perhaps Bradshaw is right: given all the obstacles that attended the construction of this theatre, its mere existence is cause enough for celebration. And Crabb is right, too: there’s something very Canadian about this building – and also about the convoluted process that produced it. In its completed form, Canada’s only modern opera house is a compromise between those who envisioned something astonishing, and those who envisioned nothing at all. The project was attacked from both sides of the political spectrum: some voices on the left felt that government money shouldn’t be spent subsidizing an “elitist” art form; some on the right felt that opera should survive within a free-market economy, without government subsidy. The champions of these “populist” ideologies – both thinly veiled forms of majoritarianism, really – seem to have little to offer us except a bland, homogenous, lowest-common-denominator culture. Thanks to the COC’s perseverance, they were not successful, on this occasion.